I don’t get to go to Asda that often, it is a little further away from home than the other supermarkets, but every so often I make the effort with items for Foodstuff Finds in mind. I managed to pick up quite a few things on my last visit I hadn’t seen before and as I was walking passed the bakery section, this was the final item to make its way into my trolley. How could I resist an Oreo Doughnut, where biscuit meets spongey goodness. 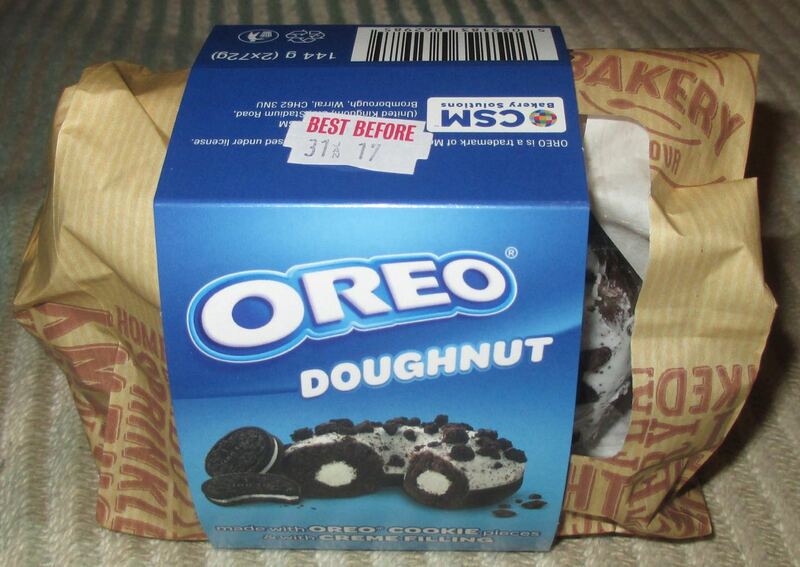 As it happened I hadn’t realised that in the wrapped paper bag there were actually two Oreo Doughnuts, so I had accidentally purchased twice the amount that I needed… these thing happen! 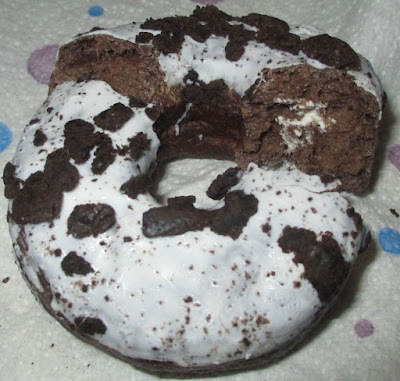 The doughnut is dark in colour, and is covered in a white icing, decorated with Oreo biscuit bits. 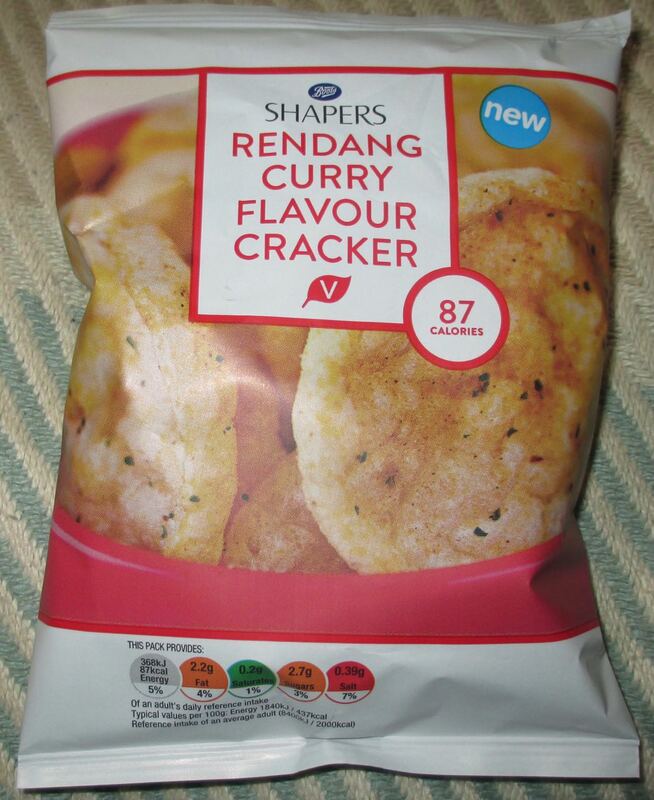 These are a lot softer than the crunchy biscuit you get in the pack but do have the full flavour experience. The doughnut is a fantastic chocolatey treat, the sponge is fluffy and moist, and the chocolate flavours are good and rich. 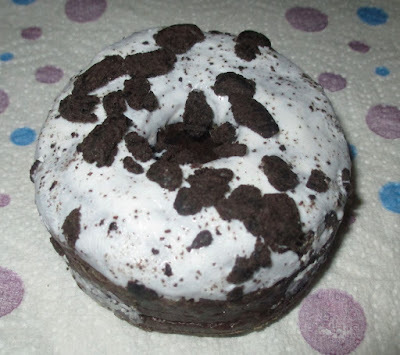 The best part is the filling inside the ring doughnut of Oreo stuff, for me this was the bit part as made it most taste like an Oreo biscuit. It just worked like magic. As it turns out I was very pleased to have discovered that I have another doughnut for tomorrow, a treat I’m already looking forward to. On such a wet day I fancied trying out the new drink in Starbucks, the Butterscotch Brulée Latte to warm me up. I have a very sweet tooth, and thought this was going to hit the spot. It promised Butterscotch and sugary goodness. The drink consists of an espresso topped up with hot steamed milk and butterscotch sauce. There are a brulée sprinkles on top too. The brulée sprinkles weren't particularly generous on my drink (as you can see), and I couldn’t really pick up on the flavour of them at all unfortunately. 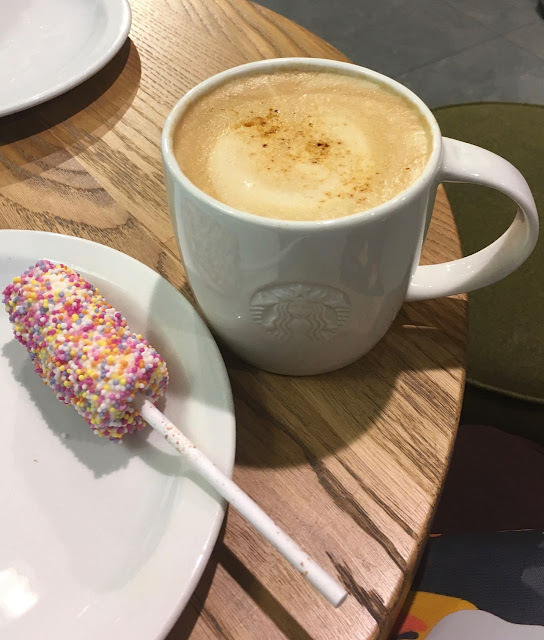 They are not designed to be served on cream, the picture on the Starbuck's menu board showed it straight on top of the coffee, but I think cream would have helped stop the sprinkles disappearing into the coffee and it would have made them a bit more prominent. The flavour of the drink was distinctly mild, there wasn’t a big sugar rush; the butterscotch taste was mild and added just a nice bit of sweetness. I found it tasted similar to a coffee with brown sugar in it, rather than a special treat for a cold wet day. It was a smooth drink, with a (unanticipated) gentle hit of sweetness. Over all it was very pleasant. My sweet tooth wasn’t overwhelmed or over excited though, but I still enjoyed my coffee. Lucky I had my marshmallows on a stick to add the sweetness. I wonder if it had been made by a different barista there would have been more generous sauce and sprinkles, I do worry about the consistency in some of the drinks. 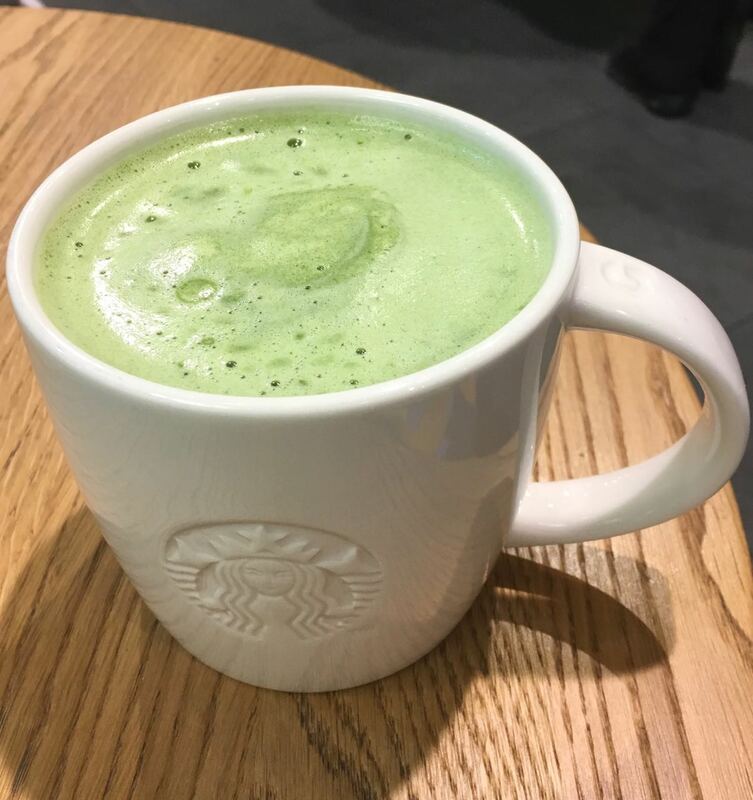 I had one Pumpkin Spice Latte in the same branch that was so overpowering it was almost undrinkable. These new biscuits from Bahlsen are in the format of a “mini” biscuit, so I shouldn’t have been surprised that they are small. They are individually wrapped, so handy for lunch boxes or on the go snacks. We previously wrote aboute regular chocolate Choco and Milk Pick Ups here. So although Bahlsen has had Pick-Ups out before these new ones are smaller and come in a new variety Choco and Milk. 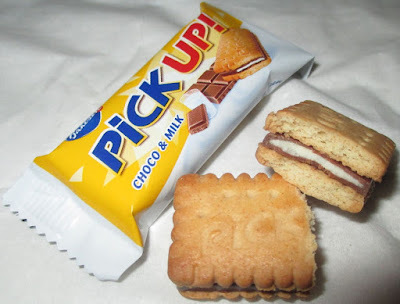 The biscuit is a double layer filled with both a chocolate and milk based filling. You can’t actually see the milk section unless you break the biscuit, as it is totally surrounded by the milk chocolate. There is plenty of chocolate in between. The biscuits had a good crunch and the filling was surprisingly dominant. The biscuit flavour was buttery and creamy, but this was enhanced by the milk section of the filling. It tasted a little like mixing both white and milk chocolate, which is actually a rather lovely combination. Cocoa goodness, with a soft creamy edge. I enjoyed a couple of these with a nice coffee, they seemed the perfect afternoon treat, and a nice pick up(!) in this cold weather. As usual, a trip to Holland & Barrett results in me finding some tasty snacks to try. In an effort to not just keep reviewing crisps I picked up these air dried apple crisps from Perry Court Farm which look a little healthier than fried potato. While there are two different flavours this is seemingly just down to the colour of Apple used - the ingredients are literally just apple. And the bag inside looks like this. The tangy flavour is green apples, sharp and exciting, the sweetflavour is red apples, warm and inviting. both taste authentically of apples. They are also surprisingly juicy and crispy too. In a pinch id prefer the green bag, but both are very edible and when offered to people who like apples the bag goes down very quickly. I bought these pork scratchings to have in the hotel room whilst holidaying in York. Little did I know that they were from just down the road near us in Wolverhampton made in the Black Country. I've tried Mr Porky's Pork Crunch before, but not his Finest Quality Pork Scratchings. 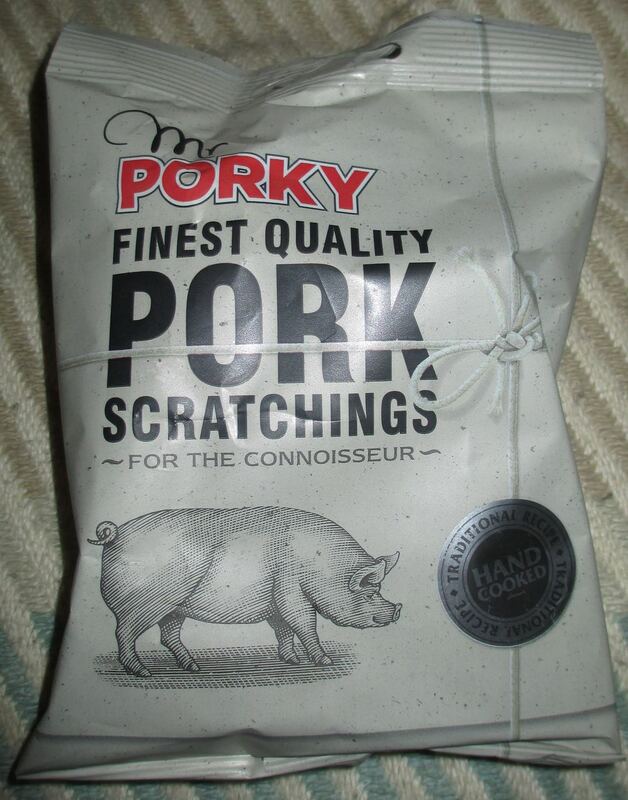 The packet states that these pork scratchings are made with a traditional recipe "for the connoisseur". Well, I certainly like pork scratchings and have tried plenty of types in the past, so was more than eager to pick up the challenge. 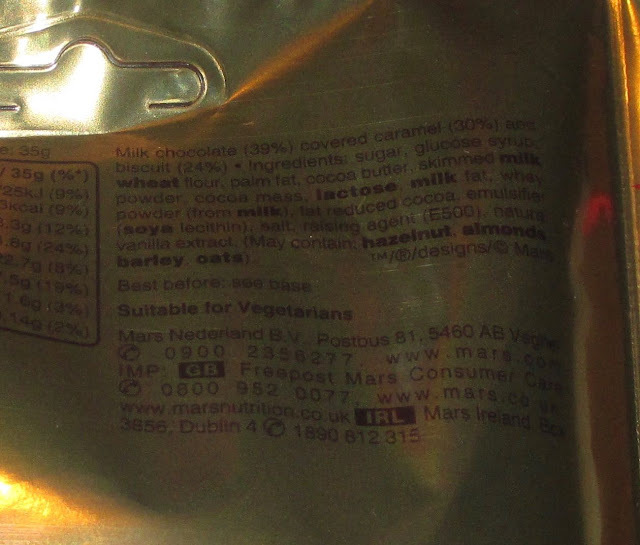 The 45g bag had a suggested 22.5g serving having 141 calories, 10.5g of fat, 0.4g of sugar and 11.1g of salt. Made with 315g raw pork rind per 100g of pork scratchings. 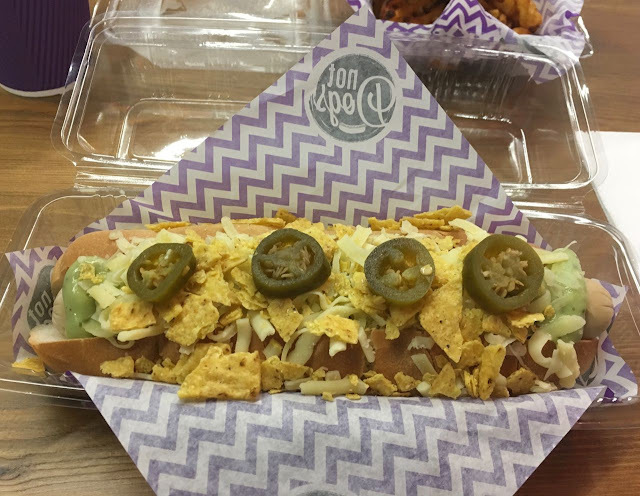 Ingredients included; pork rind, pork fat, salt, monosodium glutamate, hydrolysed soya protein, rusk (wheat flour and salt), and dextrose. 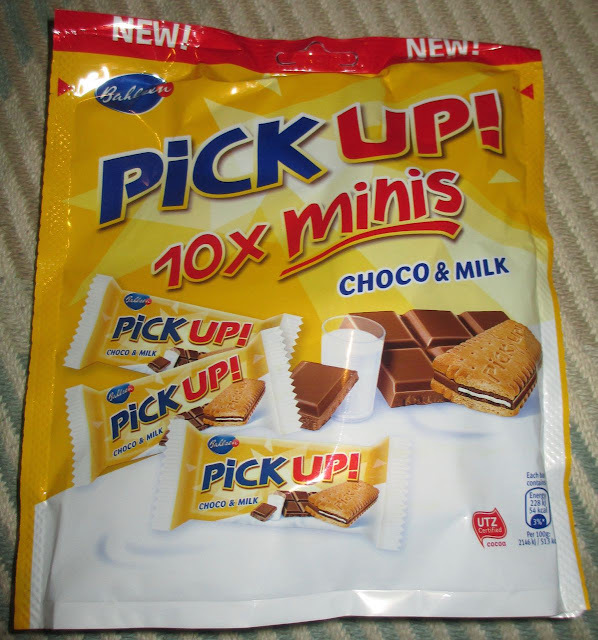 I found these chocolates in Pound World and thought that I didn’t recognise the bag. I wasn’t sure if they were new, or just something made by Payne's that I hadn’t seen before. I picked them up and when I got home checked their website and couldn’t see them listed there at all. So I’m not actually any wiser as to whether or not they are new, as they have no new label, but they are new to me, which is good enough. I opened up the bag and poured out the contents, the first thing to note is that there are a lot of chocolates in the bag, it really is quite a big portion. The chocolate also vary quite a bit in size, from large chunky pieces to small bits. This is contrast to Payne’s most famous confectionary, Poppets, where all are equal sizes. 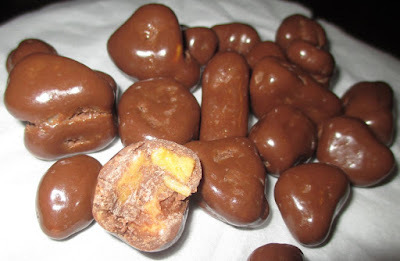 The chocolates are a mix of toffee honeycomb and chocolate. The larger pieces seem to be several pieces of honeycomb stuck together with chocolat in-between and all around them. I liked the flavour, the honeycomb is pleasingly sweet and flavoursome and the chocolate is thick enough to add lots of cocoa flavour. 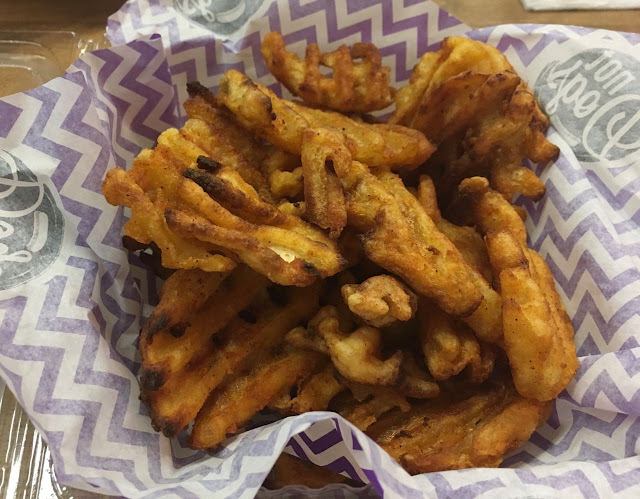 Crunching through them is fun, and I enjoyed munching my way through my portion. I liked the mixed texture and the sweet rich honeycomb taste. 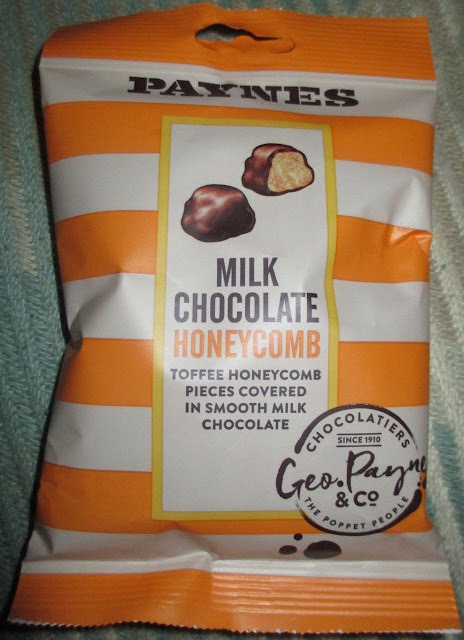 These Payne's Milk Chocolate Honeycomb may have launched without much of a fanfare, but if you see them I recommend picking up a bag. We reviewed a Wahaca meal kit last year, and so we thought we'd take another step up the schoville scale and try the medium heat kit. This is a smoky chipotle kit, which instantly makes it different to the lush green salsa of the mild kit, and closer to the Old El Passo meal kits. Well, except for the lush yellow corn tortillas! This time I came prepared. We have TWO little lettuces and tomato as the kit suggests. Did I forget the sour cream? Maybe. Didn't really matter too much, we can use a dash of mayo. Same as before - marinade with one pack and then cook in the sauce. And then do your best to artistically make little wraps! Or kind of just pile it all up like I did. We got sent this jar of Maple Bacon Jam before Christmas to try, and have been looking for a moment to give the taste test. It was from the lovely folks at The Sweet Beet. 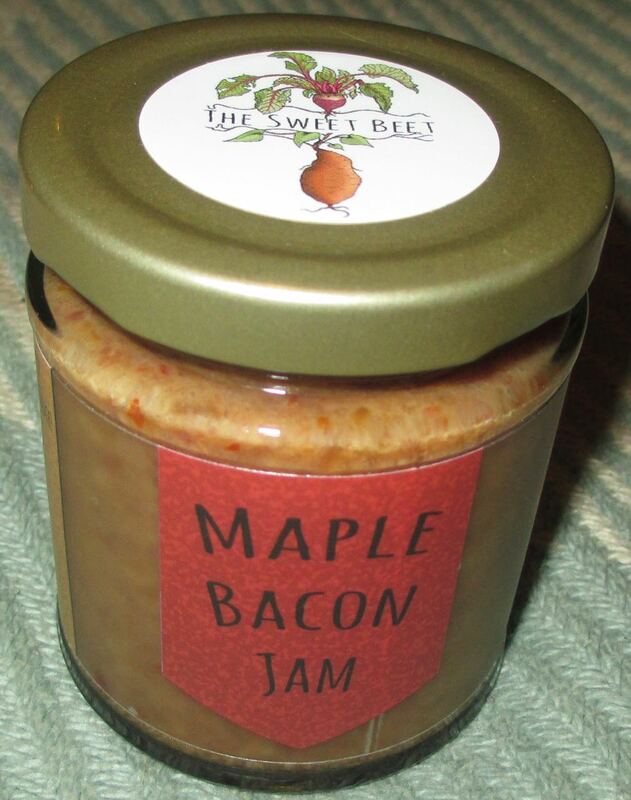 It is a mix of savoury and sweet, with maple syrup and bacon at its heart, like any proper American breakfast. It is still called a jam, but I’m not sure I’d be brave enough to have it straight on toast. We decided to have it on the side of some cheese, biscuits, gherkins etc, and thought we’d see how it would fit in. The product has a good bacon aroma, and smells really quite pleasant. 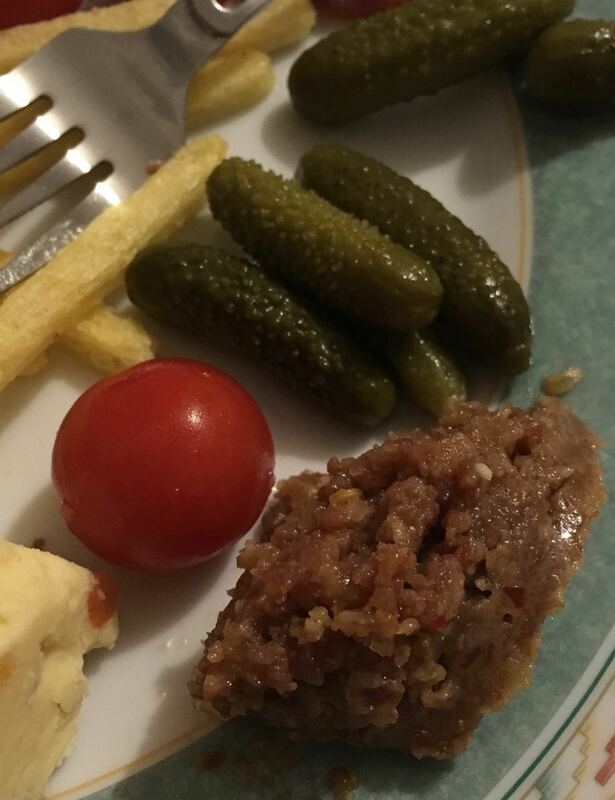 I tried a little on its own and the flavour is superb, every meat lovers dream. There is a lovely rich hit of salty bacon, followed by the hint of maple syrup with its sweetness just toning down the bacon. The product may not be that much to look at but in flavour it's a little dream. 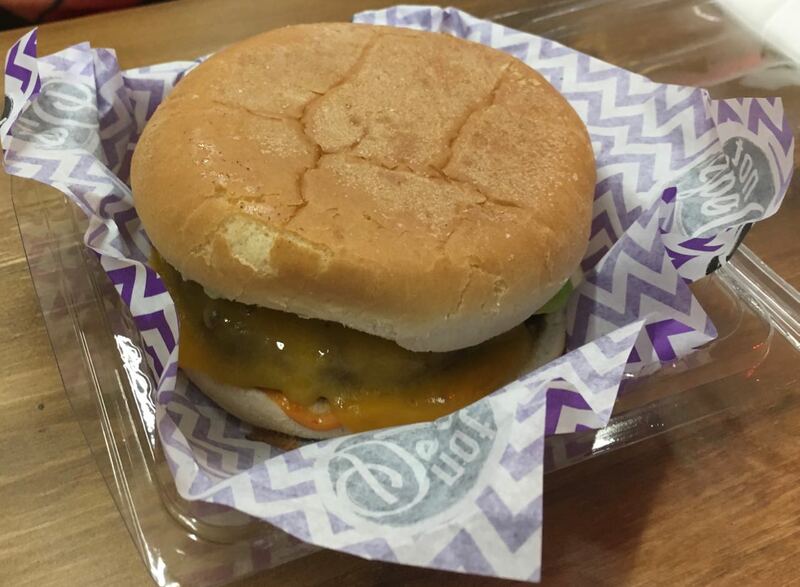 I liked the texture too, not too bitty, and fairly smooth. We noticed how well it went with cheese, so we have also tried this on cheese sandwiches, which is where I think it works the best. The flavours just work so well together, cheese, bacon, a little bit of sweet and a little bit of savoury, pure heaven. Let’s face it, wouldn’t every sandwich benefit from a little more bacon. 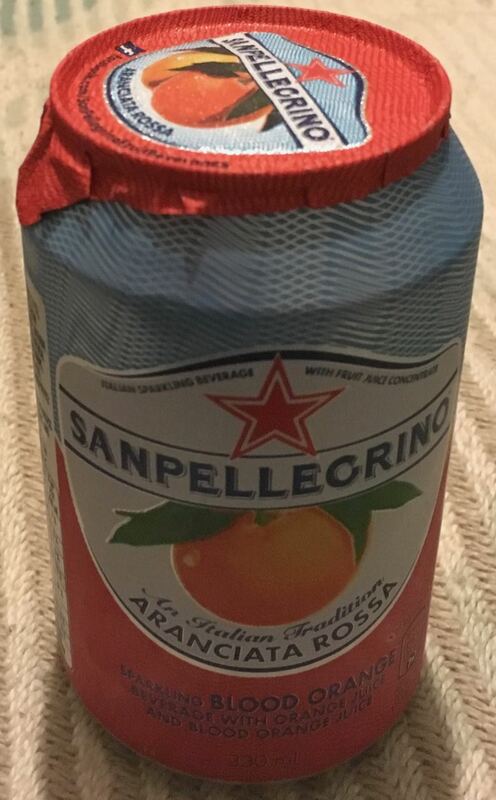 This Sanpellecrino Aranciata Rossa or fizzy Blood Orange drink sounded like a refreshing treat, and with Cinabar’s Mom constantly cranking up the boiler and blasting me with the heating I certainly need it! It’s made with part orange juice and blood orange juice. And at 135 calories per 330ml can, it’s pretty good for you and should give you a boost during the day, especially with its vitamin C qualities to help fight off these wretched colds I keep getting. On opening the can there was a pleasant fizz from the sparkling juice drink inside. The pinkish liquid tasted slightly of blood orange with normal orange juice as the dominant flavour. So you could say that this tangy drink was sparkling orange juice with an added blood orange twang! Whoosh goes the overheated Spectre trying to chill out from the overheated house. I’m still playing ball with this January is healthy thing and have accidentally fallen into the trap of lower calories products. Oh for the new releases of Easter chocolate, my sweet tooth cannot wait! In the meantime I picked up these. 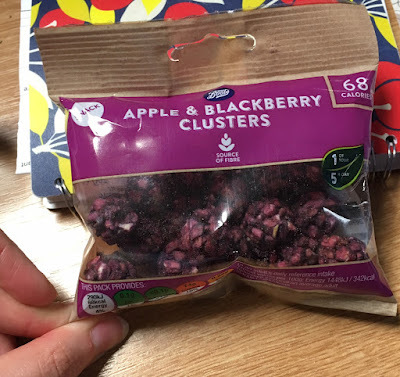 Apple and Blackberry Clusters from Boots, in the hope that something sweet might be tasty and yet ultimately fruit based. 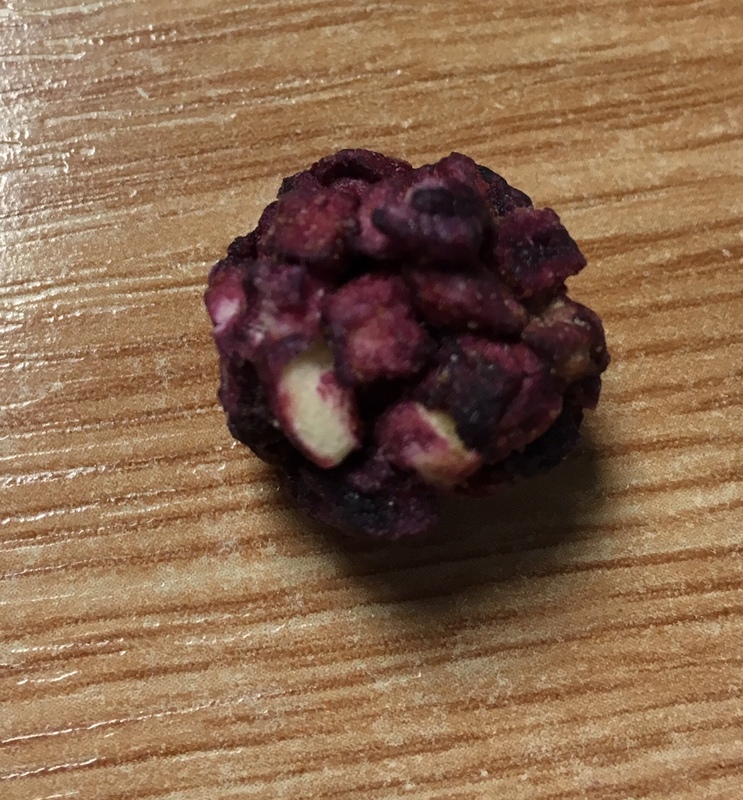 The clusters are balls of some sort of cereal based fruit snack. I got distracted by the texture far more than I should have, but they are just so odd. Not interesting and varied, I mean odd. 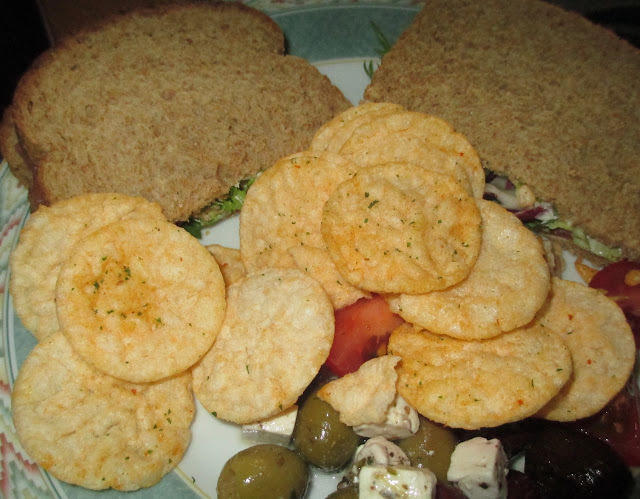 They feel like they have been freeze dried, but aren’t quite crisp enough, but they are hard too. 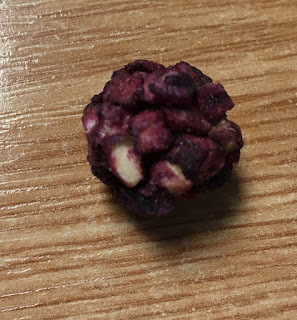 Then when you bite in you get this unpleasant crunch that goes soft and sticky really quickly. I couldn’t get passed this, I did not like the texture at all. The fruit flavours were nice, they were natural tasting and there was plenty of zingy blackcurrant. The apple softens the taste, and if it were just for the flavours I would have enjoyed them. The texture lost me, and it had me wishing I had a select few pieces of fruit to munch on instead. Or a Mars bar… I’m not good at this healthy January lark. Trying the January healthy fruit theme I thought I’d give this Forest Feast Belgian Dark Chocolate Banana pieces a try. Now I know it mentions chocolate, but I still thought it sounded a little bit healthier… ok the Belgian Chocolate part swayed me in. I decided to open up the bag and tuck in one afternoon at work. 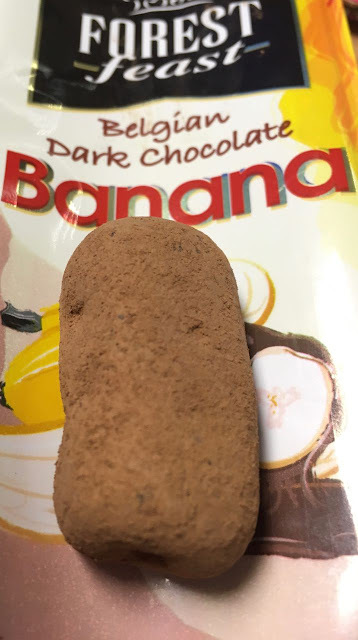 I wasn’t sure what to expect, but I assumed a slice of freeze dried banana and a coating of milk chocolate. The chunks were bigger than I thought they would be, these are big pieces of banana, in chocolate and they are cocoa dusted. Now I have to admit they are not attractive to look at, in fact they are a bit ugly, but put this aside because all is forgiven on the flavour. Thankfully the banana wasn’t hard of freeze dried, and was actually firm but still soft. This is useful as the size of some of the pieces means that you have to eat them in more than one bite. I wasn’t expecting the cocoa dusting, it looked pretty but I was at work and could feel the cocoa sprinkling on my paperwork… oops. All in all these were delicious though. The chocolate is the most dominant flavour and they had just a mild flavour of the fruit. They tasted like a banana flavoured fudge wrapped in cocoa goodness. These felt so much more naughty than the fruity treat I’d planned. There was still banana in there, and I’m standing by that! 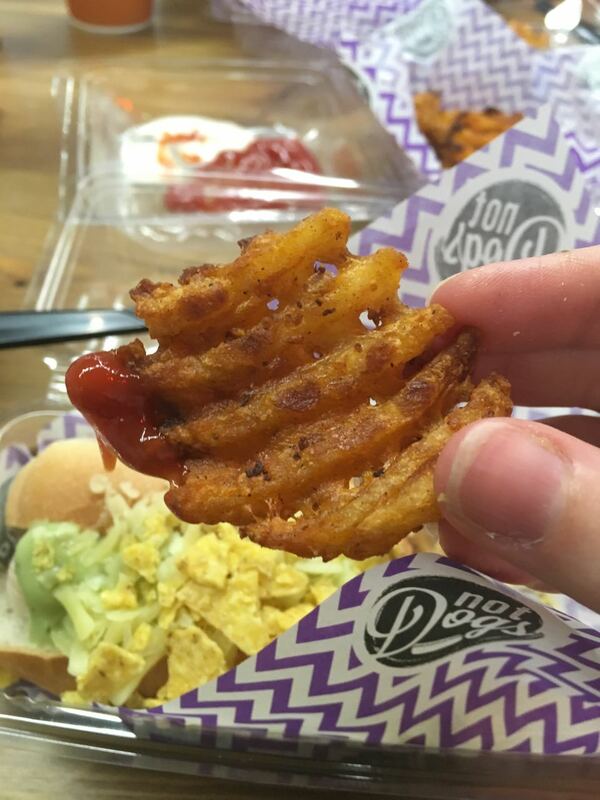 Sometimes snacks don't look like snacks. Occasionally this is deliberate, but un this case I don't think it was. 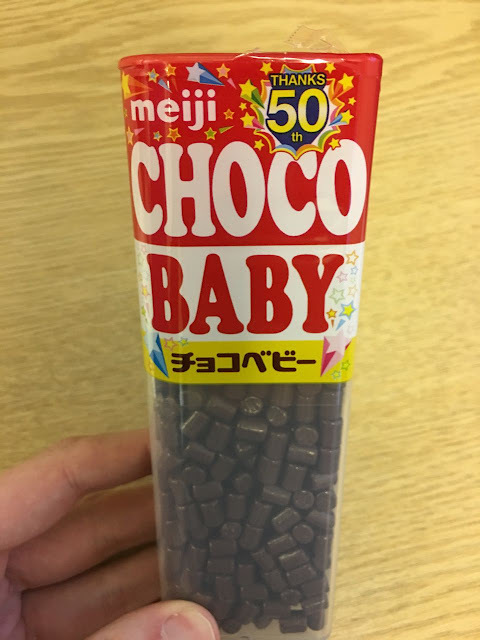 Meiji here have a large packet of Choco Baby - which look like spares for a board game. You can play Risk with these, you can use them as counters on Magic cards. And then you can freak people out by eating them! 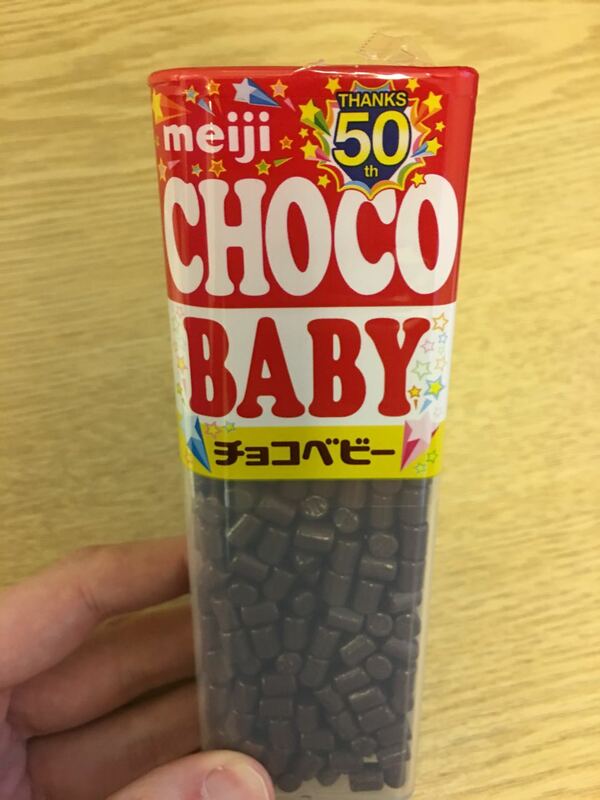 They are the kind of fondant chocolate that sticks to the outside of Pocky sticks (not Meiji, but Glico). 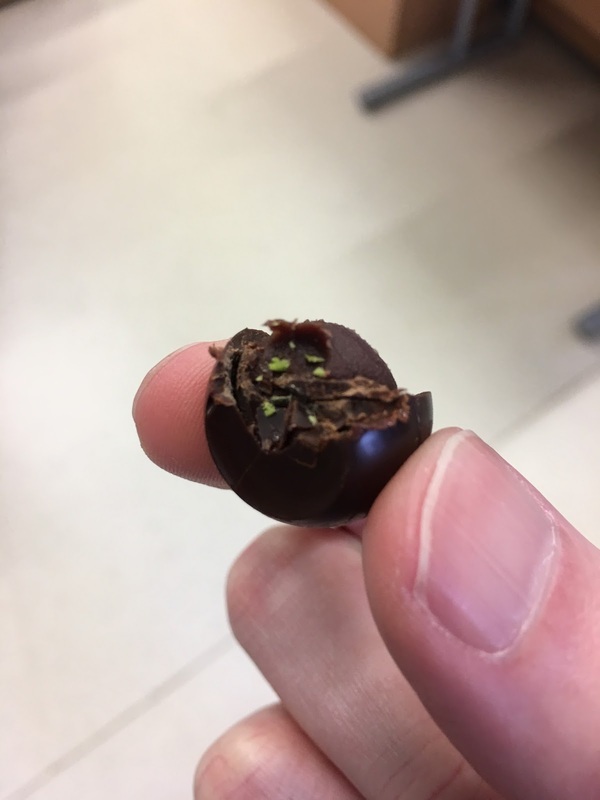 They have a waxy exterior and don't really melt, until you bite into them. Nice, but a little unusual, and great for putting out during board game night! I'd like to take this opportunity to give every reader a big wave (pun intended) and a happy new year! I know we're a little way into January now, but it doesn't hurt to appreciate everyone who takes a few moments a day to read our blogs. So, thank you! Having said that, it's freezing cold here in the UK, with driving icy winds and icy rain. I appreciate it's not nearly as cold and life hard fought as many places in the world, but it doesn't mean I can't pick up an American golden ale from Kona Brewing Company in Hawaii, and wish I was there on a sandy beach watching hula championships, beach volley ball and the big waves hit the beach. I'm sure I'd probably have a go on a surfboard too, but I wasn't able to stand up on one last time I had a go when I was a lad. Served in a 355ml bottle this 4.4% volume golden ale practically begged me to hop on a plane before opening. Big Wave has a very herby hoppy smell to it that tickled my nose hairs. On pouring the shining golden sheen to the beer made me dream of hot summer afternoons and forget the cold outside. This is a refreshing beer. I know I've had plenty of beers in my time that were refreshing, but the label on the bottle screams "refreshing", the hoppy bitter smell taps you on the nose and says "Aloha, refreshing", and the flavour washes over the tastebuds like a big glorious wave of refreshingness transporting me away to some far off sunny beach. The hops keep on giving masses of flavour almost from the initial malty slightly sweet flavour as your tongue awaits the hoppy wave like a surfboard awaiting the foam. Gosh what a splash of herbal hoppy flavour, there is still underlying sweetness here from the caramel and pale malts as each work together to lift your feet up onto your tongueboard as you ride the refreshing crest of hops right into the aftertaste. Mmm… refreshing! Now, where's the barbeque? 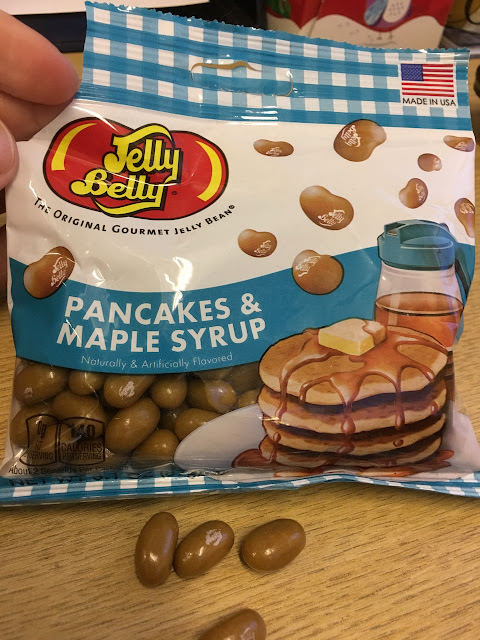 As part of a gift package from my parents of import foods I was given these Jelly Belly ( G lie Bee Lie) Pancakes and Maple Syrup flavoured beans. After the amount of horrible, awkward flavours I'd eaten over New Years I figured that this couldn't offend my senses too much. And mostly I was right! As usual you get a decent amount of beans in the bag, but contrary to my personal tastes they are all the same kind. The smell is pretty intense and it's kind of like spilling maple syrup on the counter, only sweeter and more offensive. Jelly Belly are the kings of the flavoured beans and they know that the smell is most of the appeal, but my goodness this is a strong one (and the reason I delayed opening). As for the taste - it's more like what you'd expect - mostly maple syrup. 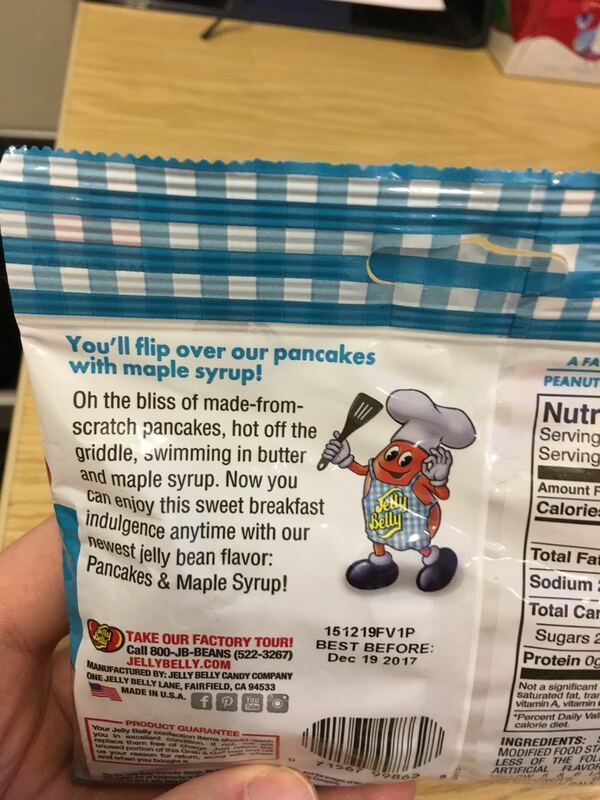 I'm not sure how they would capture pancake without topping, but it's not detectable here. 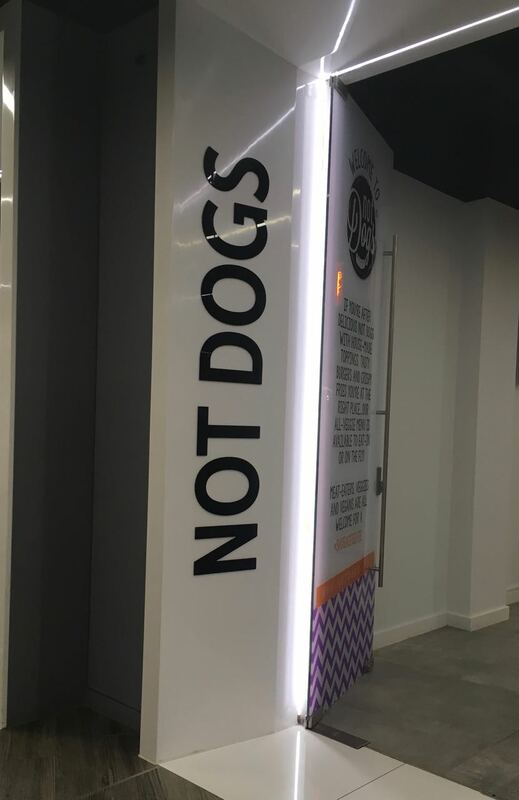 And they are edible. Not wow let's have more compulsive, but you can eat a few. And most people will try one too, but few have more than about three. The Jelly Bean mascot seems fairly pleased with himself, but I'm not sure anyone needs a big bag of these. This small bag will get eaten eventually, but if it was mixed with three or four other American Breakfast treats (heck there is already a hint of coffee here) then it'd be quite interesting. As it is, other than making my office smell like maple syrup, it's not really successful. I do like a Twix on the evening for pudding with a cup of black coffee to wash it down with, so these Twix Bites seemed like a good idea. They come in a re-sealable bag for several nights' snacks or for sharing. I'm a bit of a greedy fellow (you may have noticed)… well, actually a very greedy. I'm like a teddy bear in a chocolate shop. Sharing isn't a word I use very often, unless I don't like something… Then I can be very generous indeed. 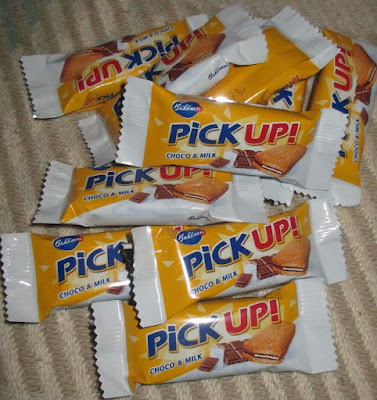 In fact Cinabar knows me of old and knows that if I try to offer someone a sweet or crisp then they will unlikely like it also. 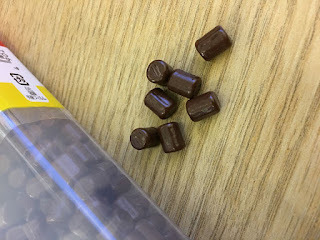 I greedily tore open the packet to find a multitude of mini Twixs, which were about half an inch long, the thickness of a normal Twix, and packed into the tight space. 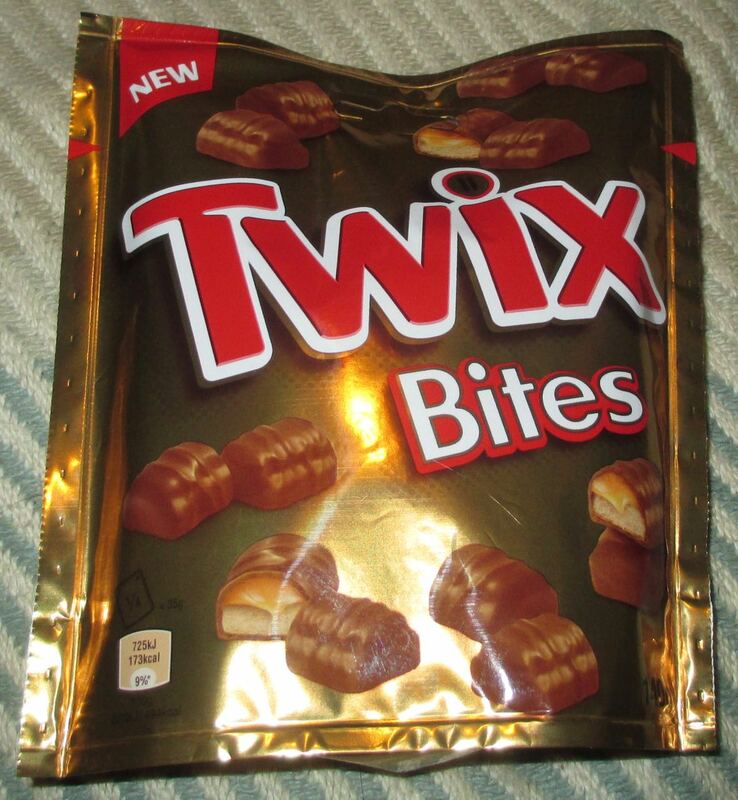 It wouldn't have been much use taking a photo of the inside of the bag as they looked pretty much like the mini Twixs on the outside. Besides they didn't last long enough to get the camera out of the drawer. Each one tasted great. 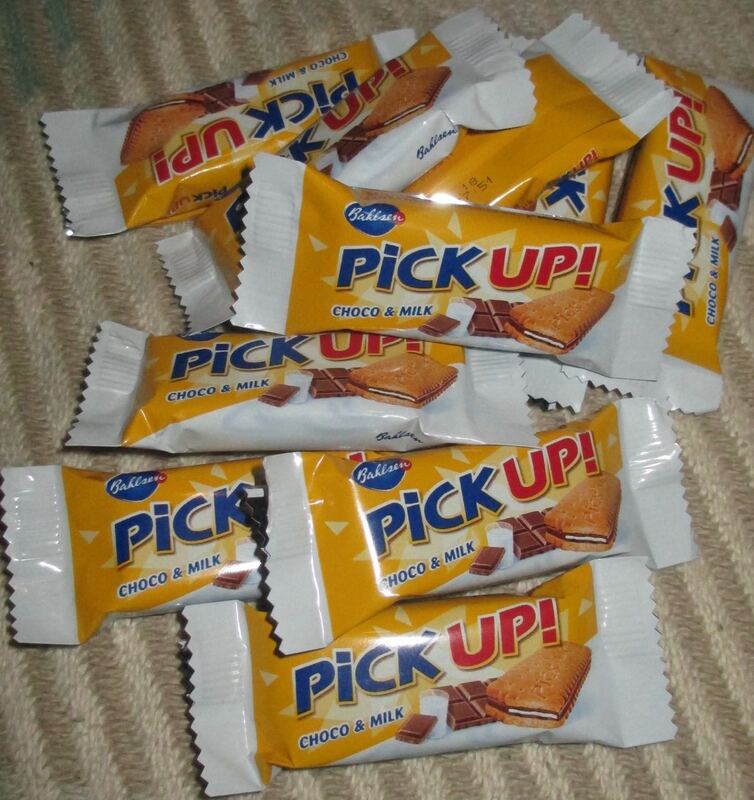 Crunchy biscuit, smooth caramel, and milk chocolatey. Pretty much like eating a normal Twix without the biting in half. A pretty tasty chocking hazard if you don't bite them at all though! I was just dropping one after another into my mouth, on my own, whilst watching TV, away from people who might like to share, and completely ignoring the 35g suggestion for a portion size. I finished the bag in record time before anyone could come in and take a photograph of them or heaven forbid try to eat one! Good stuff… Only the insane may share. 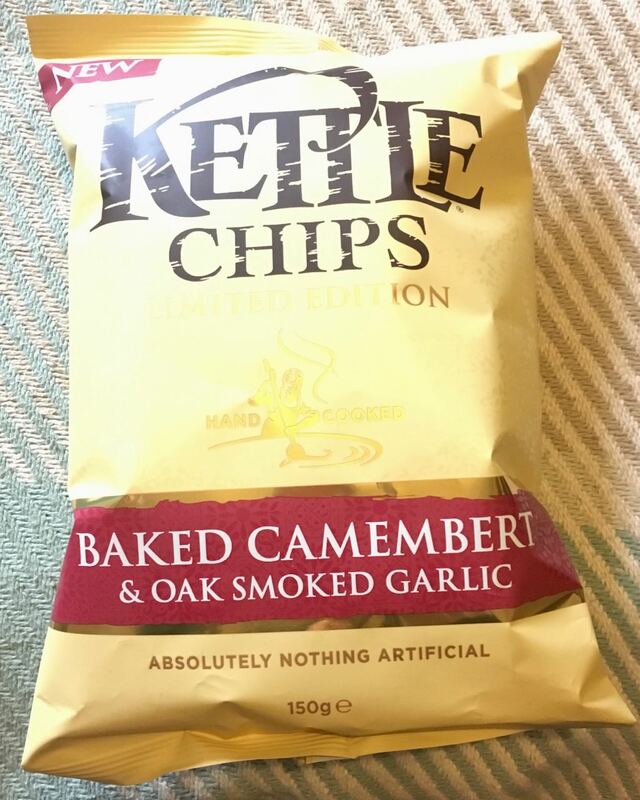 140g bag with 173 calories per suggested 35g share, 8.3g of fat, 17.5g of sugar and 0.14g of salt. Ingredients in the photograph. 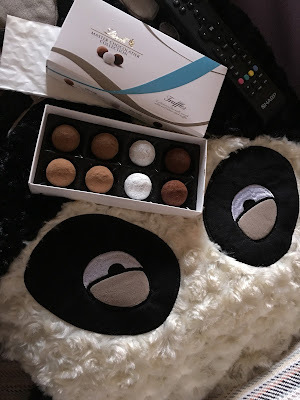 Over Christmas we got or bought a selection of little chocolate balls with truffle centres. 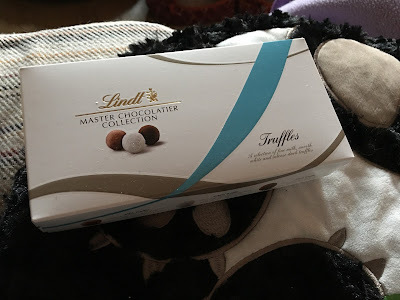 The first of these is Lindt's Master Chocolatier Collection which is a lovely little gift box. This contains 2 dark, 2 white and 4 milk chocolate balls covered in appropriate dust. Panda cat bed not included. This is a really nice way of presenting the Lindor balls without their wrappers and with a bit of dust on the outside. Nothing too fancy in concept but as always yummy and melty and perfect for cinema nights at home! 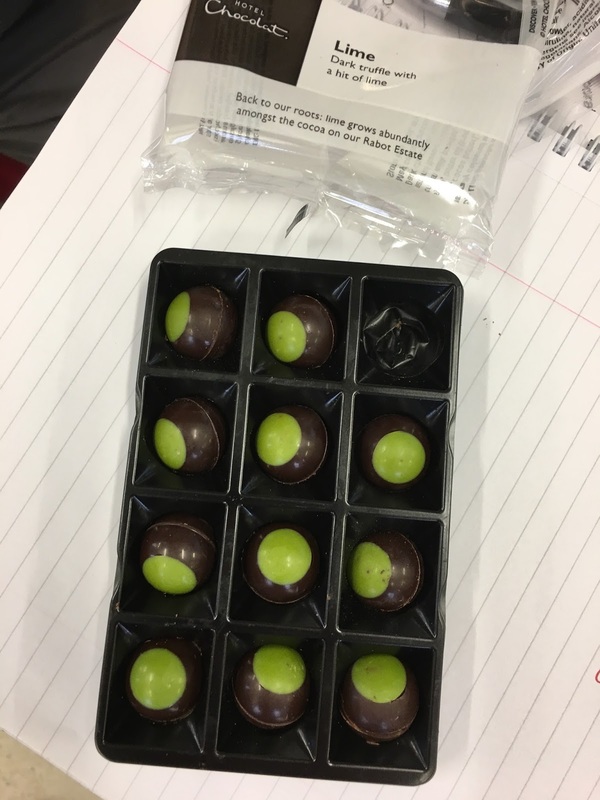 I purchased the Hotel Chocolat version of the Lime Barrel to gift at Christmas to my boss, and luckily got to try one. While the same in spirit these have a soft centre instead of a liquid one. They look a little less gifty than the box above, but the quality is no less than the Lindt. These have the lovely strong chocolate with a sizeable lime hit in the smooth textured centre. I may have to sneak a second one of these as there seems to still be a few left! These are still not quite as good as the Monty Bojangles boxes though, and as I haven't had any of those since last winter (well not in any sizeable quantity) I think once we've broken the back of all the chocolates in the office and house I may treat myself to a box.